Occupation: Criminal, former quantum physicist and inventor. Edwin Gauss was hailed as America’s greatest genius since Mr. Terrific, and succeeded in completing Einstein’s Unified Field Theory. While working for Keystone City technology mogul Norman Bridges, Gauss used that knowledge to create a suit that would enable travel from three-dimensional space into 2-D and 4-D space. Bridges had promised to treat Gauss’s daughter, Meredith, for a rare medical condition. As soon as the suit was complete, the treatment stopped. Not long after, Meredith died. 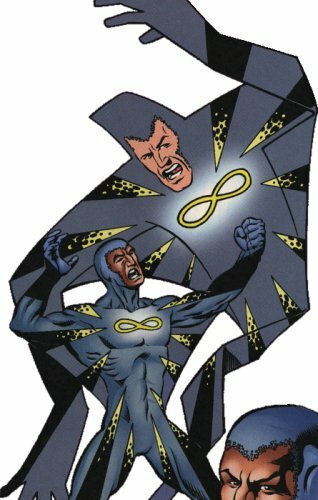 Bridges claimed (unconvincingly) that it was a clerical error, but Gauss stole the suit and used it to go after Bridges for revenge. By shifting into two-dimensional space he could slice through objects more cleanly than the sharpest razor. By shifting into four dimensions, he could simply leave our plane and pop back in anywhere. While Gauss prepared for revenge, Bridges hired a private strike force to get back the suit. He didn’t much care whether Gauss survived or not. 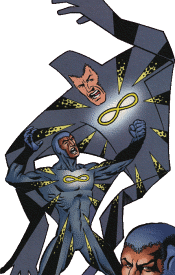 Gauss was finally captured by the dark Flash, who pinned him to the third dimension with rebar stakes (Flash #154, 1999). He escaped not long afterward, and remained at large until his recent capture (Flash #208, 2004).